"Symphony hall" redirects here. For other uses, see Symphony Hall. A concert hall is a cultural building with a stage which serves as a performance venue and an auditorium filled with seats. 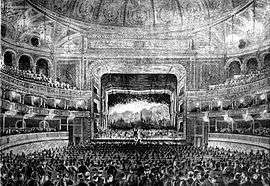 While early halls built in the 18th and 19th century were designed for classical orchestra, concerto and opera concerts and ballet performances, halls built in the 20th and 21st century were often built to accommodate a wider range of performance types, including musicals. In the 2010s, popular music such as rock music and traditional music such as folk music are also performed in these venues. Many concert halls exist as one of several halls or performance spaces within a larger performing arts center. 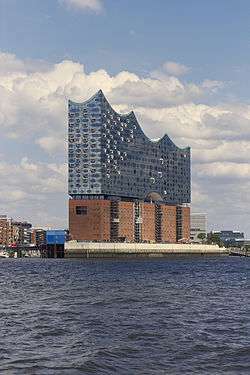 In many towns, the concert hall is combined with a convention center. Concert halls typically also contain orchestral rehearsal rooms. Many larger cities have both public and private concert halls. 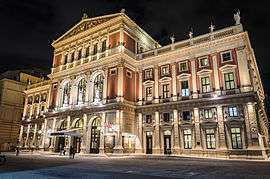 Particularly in smaller cities with fewer alternative venues, concert halls may also be used to accommodate other activities, from theatrical performances to academic presentations and university graduation ceremonies. This list does not include other venues such as sports stadia, dramatic theatres or convention centres which may occasionally be used for concerts. The list is organised alphabetically by geo-political region or continent and then by country within each region. Busan KBS Main Hall 1985 2847 Family Musical "Frozen"
Teatro dal Verme 2001 1,436 Orchestra "I Pomeriggi Musicali"
See also Broadway Theatre for a listing of the theatres that support Broadway shows. 1 2 3 4 5 6 7 8 9 Venue Partners Leisure and Cultural Services Department, Hong Kong] Retrieved on 27 February 2012. ↑ "Årtal och händelser i Jönköping" (in Swedish). Jönköpings historia. Retrieved 2 March 2015. ↑ "Main Theater Specification Sheet" (PDF). Retrieved 2009-04-04. ↑ International Association of Venue Managers website. ↑ World Council for Venue Management website.